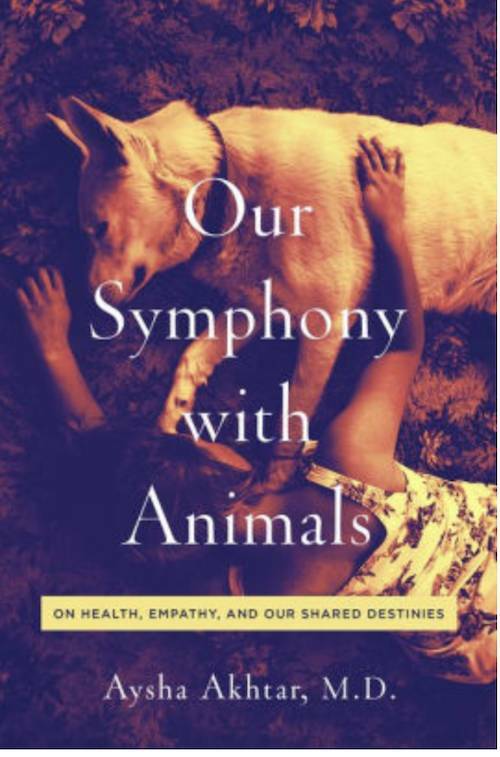 Our Symphony with Animals: On Health, Empathy, and Our Shared Destinies By Aysha Akhtar, M.D. "In her deeply personal and highly readable book, full of stories that surely will move readers all over the place, Dr. Aysha Akhtar seamlessly weaves humorous and touching moments along with the latest research on animal-human relationships. She shows why the development of close relationships with other animals that are filled with trust, respect, compassion, empathy, and love are mutually beneficial and a win-win for all. Highly recommended for a global audience." "An impassioned and moving argument that empathy with animals deeply affects humans' health….a heartfelt call for compassion for all living species." “Did you ever hear a deer cry?” Jesperson asks me, suddenly switching topics. “A rabbit will scream, will actually cry or scream. Aysha Akhtar, M.D. is a double Board-Certified in both Neurology and Preventive Medicine and has a Master’s Degree in Public Health. She serves as Medical Officer for the Office of Counterterrorism and Emerging Threats of the Food and Drug Administration, for which she has Top Secret Security Clearance. She is an Officer (Lieutenant Commander) in the U.S. Public Health Services, in which she deploys to assist with national public health emergencies. She is also a Fellow of the Oxford Centre for Animal Ethics and is a Consultant Editor for the Journal of Animal Ethics. She is the author of Animals and Public Health and lives in Maryland.